We all gathered at Pete’s Pub for a burger or some conch. Sailors slowly made their way to the harbour and Dave Mulock set a good course. We had one of the best sailing days on record in Little Harbour last weekend, Jan 28. Winds were out of the south/southwest at a steady 10-12. We were able to set a long course which allowed the sailors to tack several times upwind and play the shifts. The windward mark was close to the beach, so it was a little shifty for the mark roundings. And the windward mark was just beyond comfortable viewing for those with failing eyesight. Just about everyone missed the windward mark or offset mark at one point. The new extension to the long dock was an excellent place to race from. It was up high and got us out into the deep part of the harbour. We got off to a good start with 4 or 5 quick races. Then batteries started going dead and some were losing control at the windward mark. 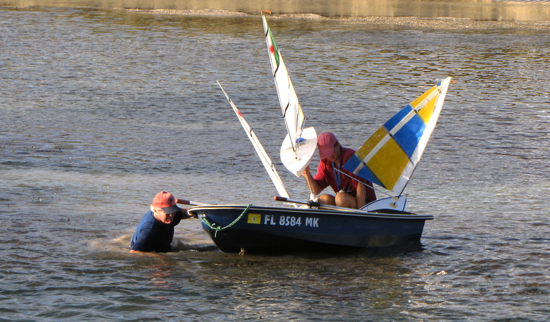 Then a few boats got wrapped up and needed to be rescued (thanks Dave). Then another boat unspoiled, and yet another boat lost its keel while being lowered in the water when it slipped off the hook. Dave dove up the broken keel (thanks Dave). Repairs have since been made. Victor Patterson sailed with us for the first time and Dave Stratton also joined us after a long absence. Randy Key sailed consistently winning race 3 in between a string of seconds, and finishing second overall. Dwayne Wallas won the last race, finishing 3rd overall. Jim Kaighin took the top spot winning the remaining 5 races. Click here to view all of the photos from the regatta. Thanks again, as always, to our race committee Lenore and Ylva. We appreciate Anders and Ylva Ljungholm making the long drive from Treasure Cay. The sailing was so good and the food was so good at Pete’s Pub, we are going back again next weekend! 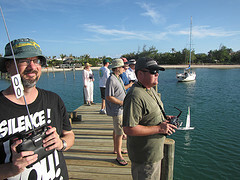 Unfortunately, Hope Town was not able to accommodate us, so we will head back to Pete’s Pub and Little Harbour. So if you missed it the first time, you will have a second chance. Round 4 is scheduled for Little Harbour on February 11th at 3:00. Come a little early and have lunch at Pete’s Pub. March 24 is Schooner Bay and April 7 is Man O War. This race report was submitted by Jim Kaighin. To submit a race report, send a few high quality photos or a link to your pictures online and a paragraph or two along with the results to rclaserclass@gmail.com and we’ll put it together for you as a post.